President of Mongolia Khaltmaagiin Battulga received today Mr. Julian Knight, the UK Trade Envoy to Mongolia and MP. Upon welcoming the latter, the President congratulated Mr. Knight for being appointed the Trade Envoy at the order of the UK Prime Minister Teresa May, and wished success. “I do not doubt that your appointment as the Trade Envoy to Mongolia will be a strong impetus to deepening and broadening economic and commercial cooperation of the two countries,” President Battulga highlighted. He pledged to put maximum effort to broadening bilateral trade and economic cooperation. Mr. Knight shared that he met with the affiliated Minister and discussed cooperation in mining sector, as “the sector takes up a major position in bilateral relations”. Mr.Knight underlined the two countries have full potential to collaborate in diversifying Mongolia’s economy, while mentioning that he is familiar with the President’s commitment to economic diversification. President confirmed that the two countries have potential to cooperate in mining. However, he said, “it is not preferable to emphasize mining. There is now a big gap between rich and poor, in other words, “resource curse” has befallen of Mongolia. In order to tackle this problem, we have been turning to our other major economic sectors such as tourism and agriculture. 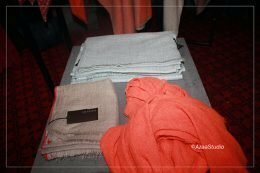 Mongolia has more than 60 million heads of livestock, and nearly 10 thousand tons of cashmere is “exploited” every year. This is 60 percent of the world cashmere market. If you are willing to cooperate with us in this area, we have the raw material. In a presence of processing industry and well-managed marketing, the sector is promising enough to become as large as Oyu Tolgoi. It’s safe to say we do not have a competitor in this,” the President said and wished the Envoy to pay more attention to this sector. Mr. Knight accepted the President’s suggestion and mentioned the possibilities of selling Mongolian-made cashmere products in Great Britain. The sides further touched upon the impacts of the latest trade deals of the US and the People’s Republic of China on Mongolia. Trade turnover between Mongolia and UK reached USD 689.9 million in 2017, in which exports made up 660.5 million and imports, 29.4 million. This represents 24 percent increase against the previous year’s performance. Between 1990-2014, UK investments worth USD 116.8 million were registered. The amount constitutes for 0.82 percent of total foreign investment in Mongolia. Thus, UK is ranking at 14th place out of 112 countries investing in Mongolia. 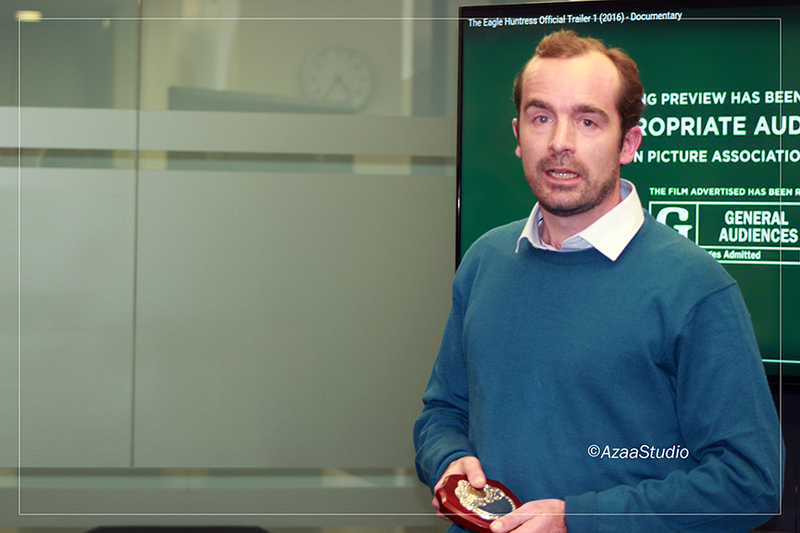 Julian Knight was appointed Trade Envoy of the United Kingdom to Mongolia last January. 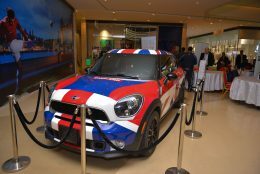 It is a custom for the British Government to appoint a Trade Envoy to represent the Prime Minister in order to activate commercial and economic interaction with another country. The United Kingdom has appointed 30 Trade Envoys, thus far, to manage trade relations with 59 countries. 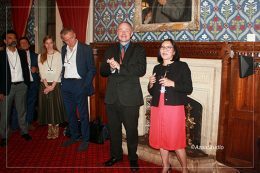 On Tuesday, 06 November 2018 the Mongolian British Chamber of Commerce organised a reception in the Jubilee Room in Parliament. 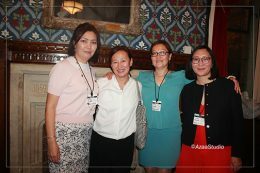 The theme of the event was “Mongolian Tourism”, which was organised in association with the All-Party Parliamentary Mongolia Group. 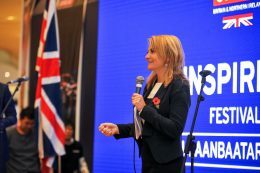 It took place in the week of the London World Travel Market. “Our vision is that all cashmere is produced in an environmentally friendly way that safeguards the livelihoods of herding communities and protects the important, fragile environment in which they live”. 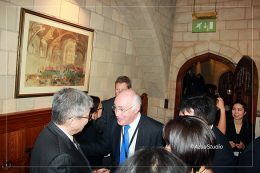 British Ambassador to Mongolia Philip Malone and British Trade Envoy to Mongolia Julian Knight MP came at a breakfast briefing meeting in the Commonwealth Parliamentary Association Room ( off Westminster Hall )in Parliament on Tuesday 22nd of May. 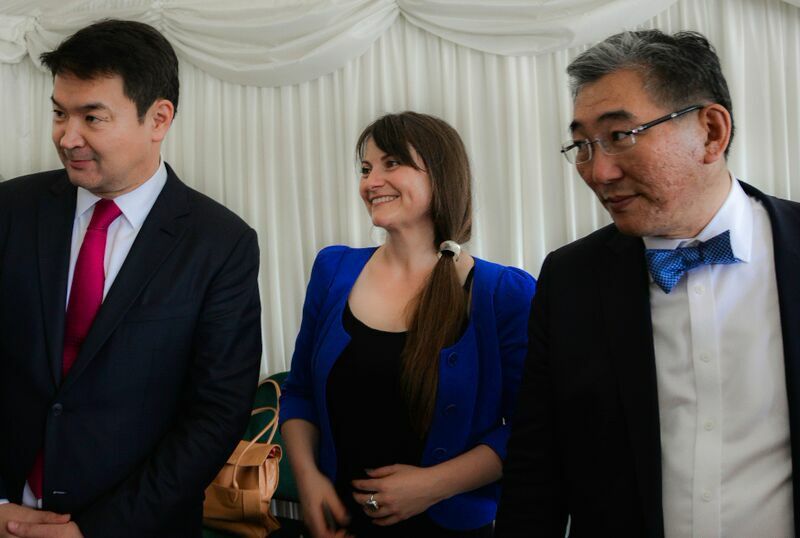 This was a joint meeting of the All Party Parliamentary Mongolia Group and Mongolian British Chamber of Commerce. 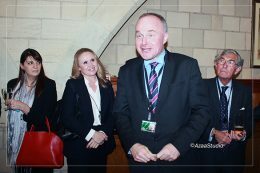 The Annual Parliamentary Reception of the All Parliamentary Party Group of Mongolia was hosted by John Grogan MP and Chair man of the British Mongolia All Parliamentary Party Group at House of Commons on Wednesday 21st of February. 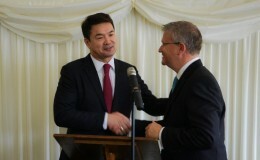 The newly appointed HMA to Mongolia Philip Malone and the Mongolian ambassador Bayar Sanjaa were present. The seventh in the series of Burns Suppers took place at the Kempinski Hotel in Ulaanbaatar on Saturday January 27th 2018. 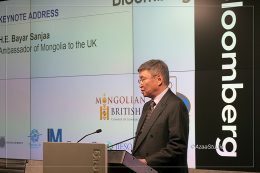 The event marked 55 years of diplomatic relations between Mongolia and the United Kingdom. It is organised in conjunction with the Honorary Consul for Mongolia in Glasgow. This took place at 6.30pm on Thursday 30th Novermber 2017 at Norton Rose Fulbright, 3 More London Riverside, London SE1 2AQ. 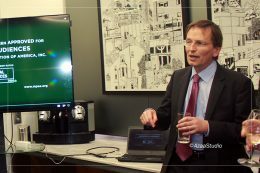 A drinks reception followed the seminar in anticipation of the Christmas season. This took place at 6.30pm on Thursday July 27th at Place Gowling WLG , 4 More London Riverside , London , SE1 2AU. 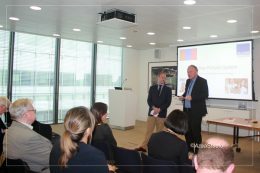 The Sixth Mongolia London Business Forum took place at Bloomberg on Wednesday April 5th 2017. Over 160 people were in attendance . 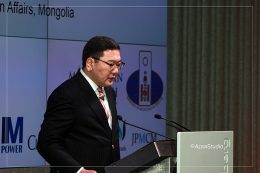 Please find links here to the final agenda, the slides used and a presentation from the Mongolian Ministry of Finance. 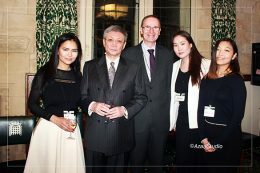 On the same day the HR Mr Davaasuren , State Secretary of the Mongolian Foreign Ministry also opened the London Stock Exchange and was the guest of honour at a reception at the House of Commons hosted by Lord Bowness from the All Party Parliamentary Mongolia Group. Fraser McColl will finish the evening with a presentation about the Lotus Children’s Centre in Ulaanbaatar. 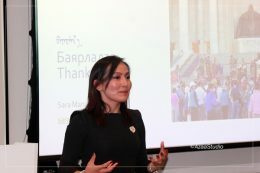 The event took place just days before the Mongolian holiday of Tsagaan Sar and a drinks reception including the finest Mongolian vodka concluded the evening. The Sixth Burn Supper in Ulaanbaatar organized by David Scott, Honorary consul of Mongolia in Scotland in association with the Mongolian British Chamber of Commerce held on 28th January 2017 in Ulaanbaatar, Mongolia. MBCC members and guests have attended the annual Christmas Drinks at the London offices of Clyde and Co on 19th December 2016. Dr Rebecca Empson and Dr. Bumochir Dulam, University College London, who are leading an EU funded study of the Mongolian economy. 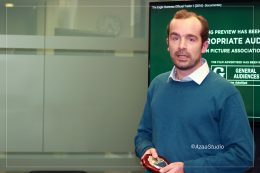 Alan Sanders, author of Mongolia – Culture Smart! 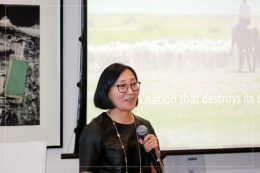 A guide to Mongolian Culture and Customs, who spoke about the Mongolian elections. We were joined at the seminar by a small delegation of businesses from Mongolia. 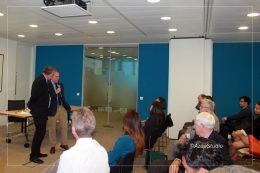 • Chris Guinness of Double Check Translation advised on language and doing business in Mongolia. The Chamber thanks Trade Development Limited for their kind support of the seminar. 23 January 2016: Burns Supper in UB! This was the 5th Burns Supper organised by the Honorary Consul for Mongolia in Scotland in association with the Chamber (for details click here). It featured Scottish bagpiper Ally McCallum, and swing jazz musician Dave Neigh. 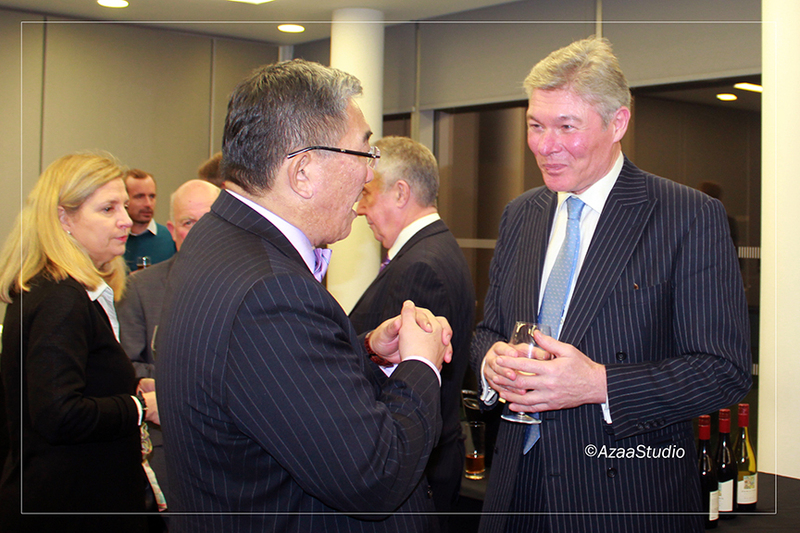 Sponsors of the Supper were invited to a whisky-tasting event on the early evening of Friday January 22nd, with guests from the top ranks of Mongolian business and politics. Anita Breslin from BG Group talked about its Mongolian activities. BG Group has recently taken a significant interest in some of the projects of Petro Matad, the first substantially owned Mongolian company to be listed on an International Stock Exchange. It is involved in petroleum exploration and development. 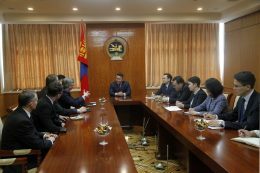 Ser-od Ichinkhorloo of B2B Mongolia spoke about the latest economic developments in Mongolia and introduced the ten members of a visiting delegation from Mongolia. Ulsbold Harper from Asia Pacific Investment Partners discussed the Property Market in Mongolia. Joyce Aleksic and Malcolm Aldcroft of Aviareps spoke about the Mongolian International Airline MIAT. The Chamber is grateful to Trade Development Limited for their kind support of the seminar. The MBCC is very pleased to have been associated with the successful working visit of Prime Minister Ch. Saikhanbileg to the United Kingdom. From June 30 to July 3, the Prime Minister and an impressive delegation of Mongolian officials and business figures met with their British counterparts, and visited some of the UK’s most important institutions. 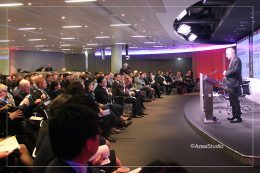 Widely reported by the media, some of the highlights of the visit such as the Prime Minister opening the London Stock Exchange and meeting with British PM David Cameron can be viewed here. 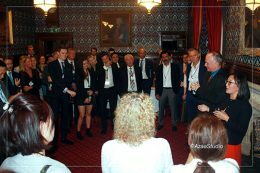 MBCC members had an number of opportunities to see and interact with the delegation, including a reception at Asia House and aWestminster Tea at the House of Commons. The Tea also celebrated the 5th anniversary of the Mongolian British Chamber of Commerce (photos courtesy of Mr Soheil Ramanian; click on photos to enlarge). 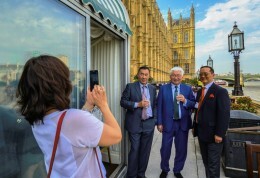 The Mayor of Ulaanbaatar E. Bat-Uul (centre) enjoys the sunshine on the House of Commons Terrace during the Westminster Tea. 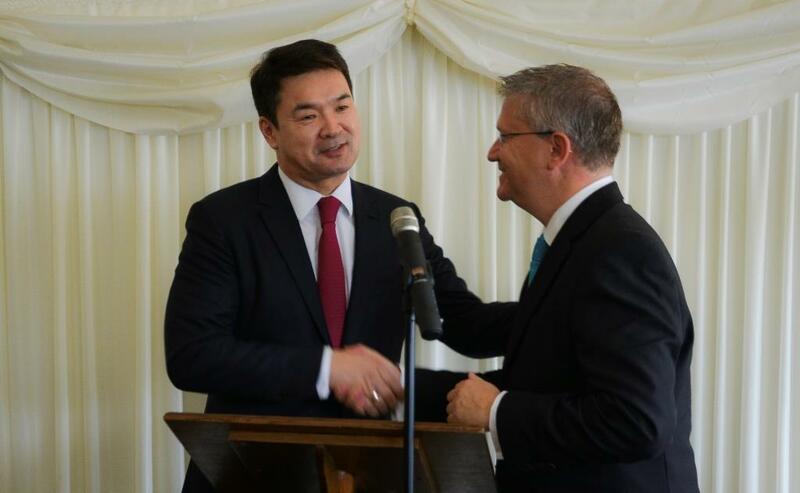 The Mongolian PM is introduced by Andrew Rosindell MP, Chairman of the Chairman of the All Party Parliamentary Mongolia Group. 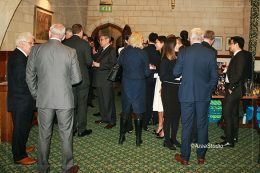 The reception was organised by the Chamber and kindly sponsored by JPMCM and Trade Development. The Prime Minister with Britain’s ambassador to Mongolia, HE Catherine Arnold, and Mongolia’s ambassador to Britain, HE N. Tulga. 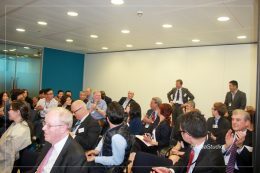 The seminar was attended by over 70 people, and was hosted by Ernst & Young LLP at Becket House in London. • John Hare, Wild Camel Protection Foundation. 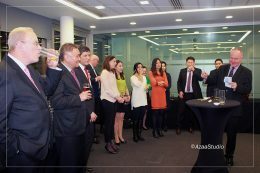 After some lively discussion, the meeting toasted the recent Mongolian New Year (Tsagaan Sar) with fine Mongolian vodka. 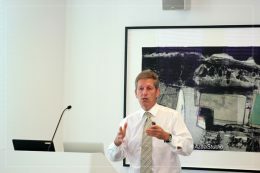 Photographs from the event can be seen here. UB Jazz Club, Ulaanbaatar. Organised by Honorary Consul for Mongolia in Scotland and MBCC, and sponsored by KPMG and UFC.